This marlin ate a Dennis Otagiri "Smoker" lure, fought for two hours, then died. Capt. 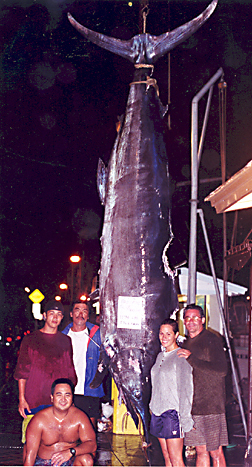 Russell Tanaka and his anglers, Paul Ortiz and Chris Cena, along with crewman Steve Tsutahara spent the next six hours raising the monster from the depths. A 15-foot tiger shark took two bites from the marlin's back (estimated at 150 lbs) before they could wrestle the fish onto the 50-foot Pacifica, the MAGIC.